Voorverkoop is gestart op zaterdag 10 november 2018 om 13:00. Was een ok feestje, vooral door het leuke gezelschap.­ Muziek Hernan was aardig, maar vond vooral in de Clubroom dat het beste werd gedraaid.­ Sfeer was goed, locatie prima maar voor herhaling vatbaar? To underground electronic music fans Hernan Cattaneo is nothing short of legendary. His dedication to not only creating the highest quality music but to empowering up-and-coming artists through his label Sudbeat has earned him a permanent place as one of electronic music’s most notable influencers. Expect a masterful music journey in a monumental industrial warehouse near the centre of Amsterdam. 험헹 헠헮헲혀혁헿헼, 헛헲헿헻헮헻 헖헮혁혁헮헻헲헼 헽헿헲혀헲헻혁혀 헵헶혀 헳헶헿혀혁 헲혃헲헿 혀헼헹헼 헦혂헱헯헲헮혁 혀헵헼현헰헮혀헲 헶헻 헔헺혀혁헲헿헱헮헺 헼헻 헙헿헶헱헮혆 ퟭퟵ혁헵 헼헳 헔헽헿헶헹. The industrial venue, part of the Westergasfabriek holds 3 rooms plus a foodcourt and chill area. The impressive warehouse will set stage to an 혢혭혭-혯혪혨혩혵-혭혰혯혨 set by Hernan Cattaneo. 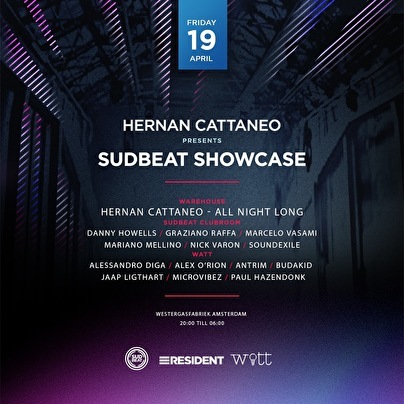 In the club room, Sudbeat will once again proof why this label has become almost as universally admired and adored as Hernan himself, with upcoming and established artists related to the Sudbeat label. Watt events is bringing local and international artists, close to Hernan Cattaneo's Sudbeat sound together.